Children are killed every day by guns in the United States. Here are some ways you can provide children the information they need to stay safe. Ask your children if they have ever seen a gun at a friend's house or at school. Remind them never to touch any gun or bullets. 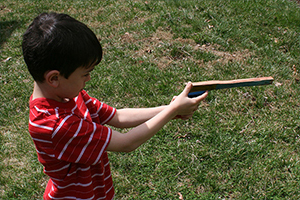 Explain the difference between toy guns and real ones. Encourage children to tell you if they ever feel unsafe at home or at school. Talk to them about violence in television, movies and videogames and prompt them to discuss their feelings. Stress the fact that guns can kill. Encourage them to make safe decisions. Invite them to come to you whenever they have further questions. Check with other parents to find out if they have a gun in their home before your children visit. Help choose programs, movies and games that are non-violent. Be a positive role model at home. Encourage games and activities that teach good decision-making skills. Be on the lookout for signs of depression, since suicide is one of the common causes of youth handgun death. Consult a professional if you feel your child seems disturbed or exhibits any signs of being suicidal.